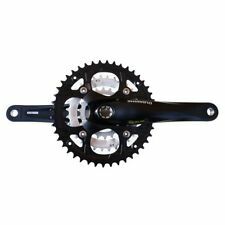 Shimano Deore LX FC-M560 7/8 Speed Triple Crankset(No Bottom Bracket). 175mm Arms. Square Taper Interface. There are no issues with the taper or any threads! Series Acera. Crankset (3x9-speed) Hyperdrive system for best front shifting. Wide variation for various choices. CRANKSET (3X9-SPEED). Inner Chainring 22T. Crank Arm Length 170mm. SMOOTH/LIGHT ACTION SHIFTING PEFORMANCE. 175mm Arm Length. 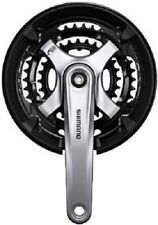 Shimano MC-31 7 Speed Triple Crankset-Special Edition(No Bottom Bracket). Square Taper Interface. Stripped,cleaned and ready to fit! Shimano FC-TY701 Chainset 7/8-speed TheShimano FC-TY701 Chainset 7/8-speed is an entry level 6 / 7 / 8-speed chainset compatible with Hyperglide chains. Kids Cycle Clothing. Polishers & Steam Cleaners. Teeth: 48x36x26T. Shimano Acera FC-M391 Chainsets. Length: 175mm. Let Cervus Bike service you! Colour: Silver Arm and Black Chainring. With Chain Guard. 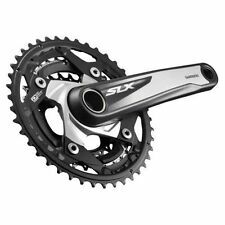 Shimano SLX FCM672 Crankset for a 3 x 10 set up, 40-30-22 Hollowtech II. In excellent condition in my opinion - the odd small mark /scratch. Minor wear to chain rings (hardly used as you can see). All as shown in images - if it's not shown it's not included. 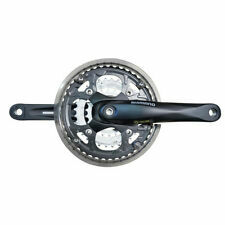 Shimano Alivio Front Chainwheel. 175mm Crank arm length. No Bottom Bracket included. (21mm push/screw in). ref 1302/3. New and unused complete with all fixing bolts and pedal washers. For use with 123 mm square taper bottom brackets. Maintainence & Tools. Hyperdrive SG-X chainrings for fast and smooth gear shifts. Sports Nutrition. Maintainence & Tools. Sports Nutrition. 48-38-28 Steel Chainset. 170mm Arms. Profiled teeth to aid shifting. Bike Sizing. Aesthetics are subject to change. Weight: 1295g. Suitable for 118 bottom brackets. Shimano index compatible. 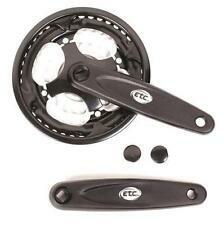 Crank Specification: 104BCD,170MM. Applicable: 9-speed/27-speed mountain bike. O (∩ _ ∩) O ~ ~. Bottom Bracket Size: BB92. We will be glad to reply and help you to solve any problem. We will do our best service to help you to solve all problems. Silver arms and black outer / silver inner rings. Arm length 175mm Power spline bottom bracket included 108mm spindle 68mm shell - no spacers Rings are 50/36 Light cosmetic marks and scratches. Please see photos of actual items for full details and description. Shimano FC-M442/3 crank arms (left right pair), triple chain rings (Shimano M9-T26, M9-T36, M9-T48) with plastic chainguard and crank bolts. Total weight 900g. 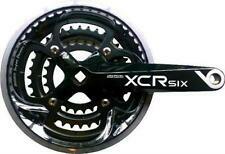 Triple Crankset for square taper bottom bracket suitable for budget MTB/Hybrid bikes. • 170mm crank arms. Triple Chainset with chain guard. Gears & Drive Train. Hare Hatch. Sunraces new range are more affordable with out compromising quality. 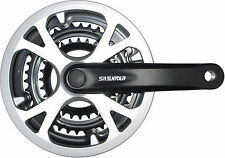 For sale here is a Shimano XT M751 3 x 9 speed crankset. chainrings are 44 32 and 22 teeth. Bottom bracket.